If there is one element of a Walt Disney World park-going experience that could split a group right down the middle, it is parades. 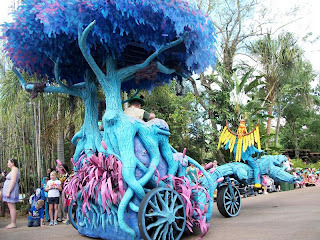 Some people love them, the music, pageantry, exaggerated floats, and even the story a procession intends to convey to guests, while others see them as only a crowded annoyance keeping them from their next destination. 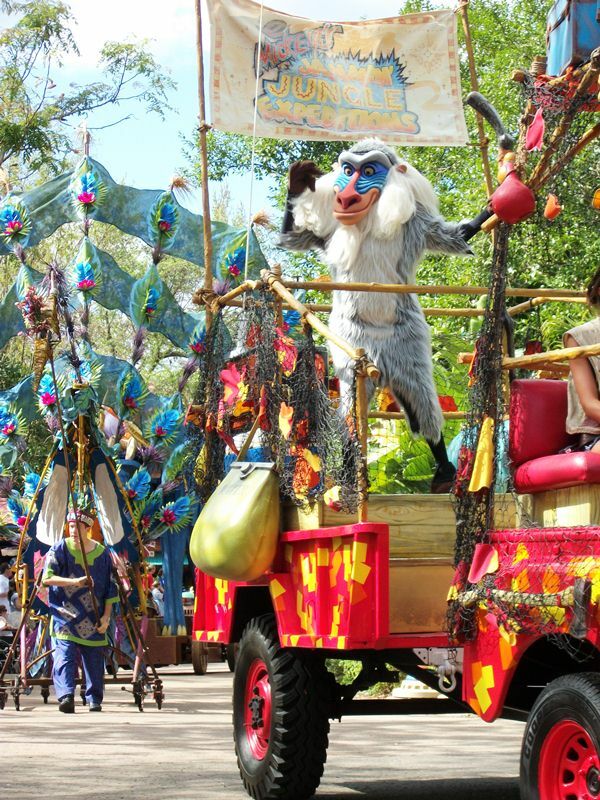 No matter an individual’s feelings towards parades, there is one in Walt Disney World that is overlooked by fans and the frustrated alike, Mickey’s Jammin’ Jungle Parade in Disney’s Animal Kingdom. Mickey’s Jammin’ Jungle Parade had its first tour of the park, which begins in Africa, takes a spin around Discovery Island and the Tree of Life, and through Asia before heading back to its starting point in Harambe, in October of 2001 as a part of the 100 Years of Magic. 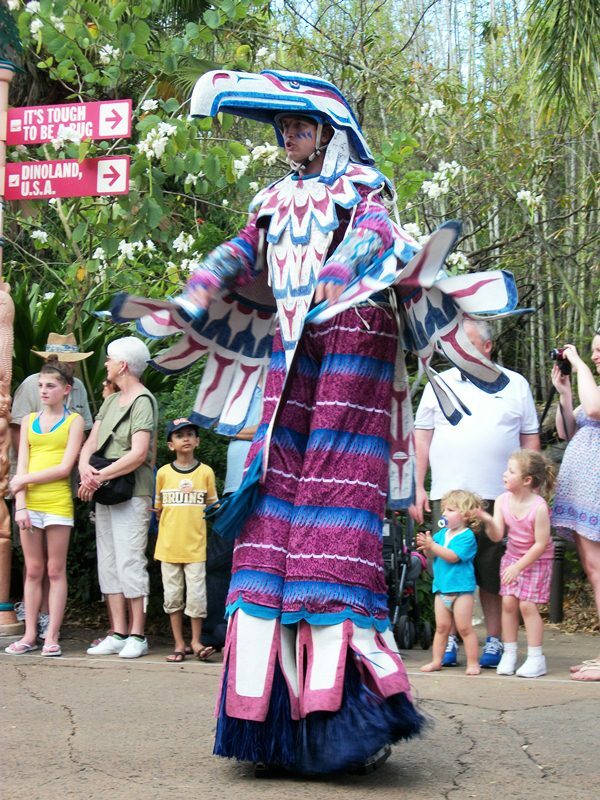 The jungle beat gets feet to tap and toes to tapping, but it is the brightly colored show elements that really steal the parade! While there are a host of performers taking part in the spectacle, there are five components that are not to be missed. Characters – These are your average characters! There are no princesses or dancing mice, no flying boys or pixies, but there are a ton of forest and jungle characters. 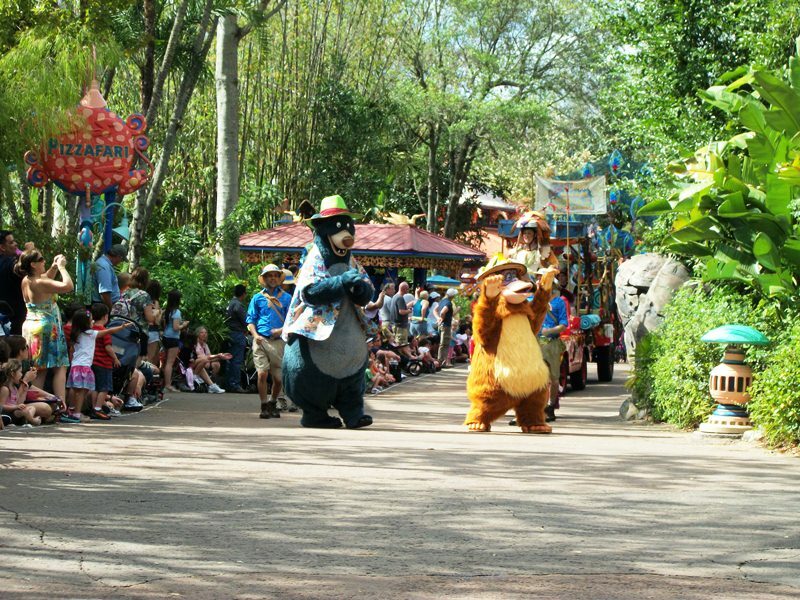 Although most of these characters, such as Br’er Rabbit, Baloo, and Turk, are at home in the jungle, they are still decked out in brightly colored safari gear. Safari Vehicles – Trucks, jeeps, and trailers all outfitted for a very colorful, and danceable, safari. These zebra striped and giraffe spotted vehicles carry the main characters of the parade, including Donald, Rafiki, Mickey, Minnie, and Goofy. Just like the characters that are hoofing it along the route, these characters aren’t complete without vests, pith helmets, binoculars and other attire required on safari. 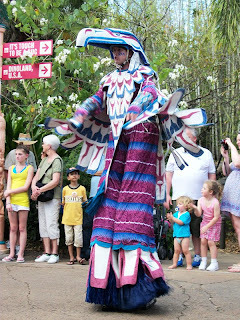 Stilt Walkers – Colorfully garbed in outfits resembling wild creatures from all corners of the globe, the stilt walkers dance and sign with ease as children, in addition to the slack jawed adults, wonder at the towering figures. Tree Rickshaws – Selected families ride in tree rickshaws. 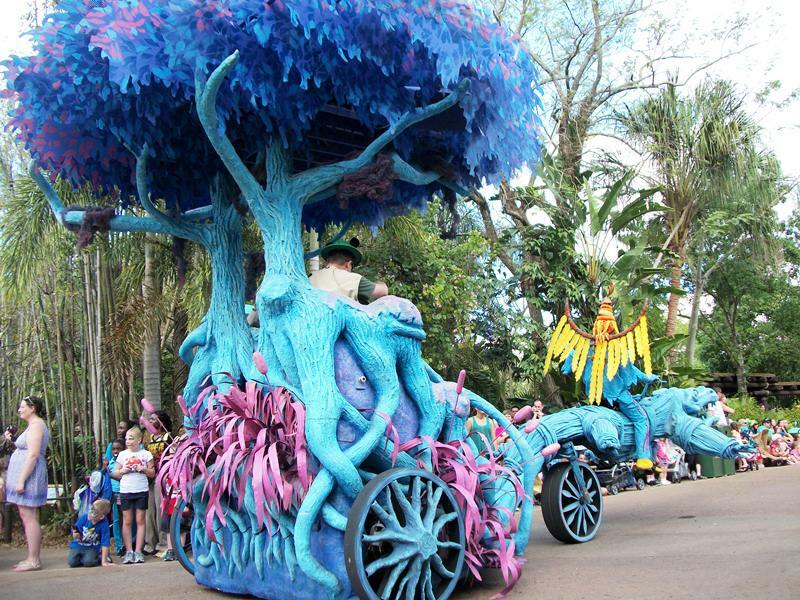 The trees, each of which is decorated in accordance with a specific color scheme, are pulled by a pedaling Cast Member riding atop a cleverly designed creature. Puppets – These are not your run of the mill Muppets (though, I’m not sure I’d ever classify any Muppet as ‘run of the mill’)! 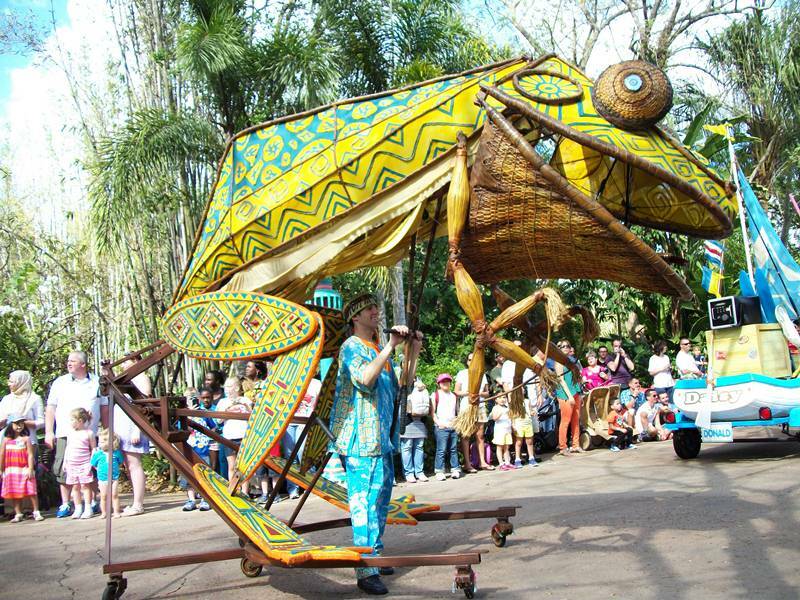 If these immense figures of frogs, peacocks, and other colorful critters seemed to remind you of the larger than life puppets from other Walt Disney World and Disney productions, there’s good reason. 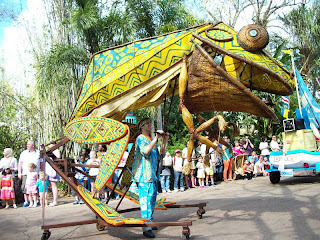 Michael Curry, who was not only responsible for the puppets of the Broadway production of The Lion King, but also Tapestry of Nations and Finding Nemo – The Musical, had a hand in crafting these unique creatures can roll along the route and mimic lifelike behaviors of their namesakes animals. If you noticed a lot of color related adjectives throughout our description of the various parade elements, you’re not crazy. This is a bright, vibrant procession that utilizes the extremes of the rainbow rather than hiding from it. When you truly study a color, such as the green in a leaf, you start to see blues, browns, and even reds. So, with such an abundance of color seeping through the natural world, why should a celebration of life, both animal and vegetable, be dazzling? We were are a bi-parade couple - one does and one doesn't. 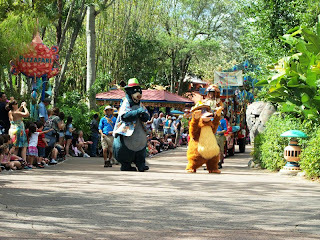 So while this wonderful parade was passing by we were eating a late lunch at the Yak and Yeti. But..we sat in the front dining room and I could see and hear the parade out the window! I don't have to tell you how I feel about Disney parades, Ryan! I don't think I've ever seen Mickey's Jammin' Jungle Parade, though. It's definitely now on the list for my next trip to WDW...whenever that may be! If we happen to encounter a parade, and the music's catchy, we'll stop and watch. But -- camping out on a walkway for a good seat instead of touring the park? It'd take a high-tech rebirth of Main Street Electrical Parade for that. 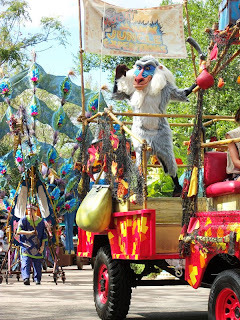 But Jungle Jammin' seems like the kind of Disney parade my family enjoys; surprising, energetic and creative. We'll try to catch it on my next trip to WDW! One of our favorite parades. Can't get that song out of our heads!